The following are some of the herbs provided by us. Capsule C This is for building up the immune system. Capsule D This is for infection and inflammation – the very underlying cause of most chronic diseases, including cancer. It is also good for itch. Capsule E This is for improving appetite and digestion. Itchy Solution is good for itchy skin, bites, etc. It is for external application only. 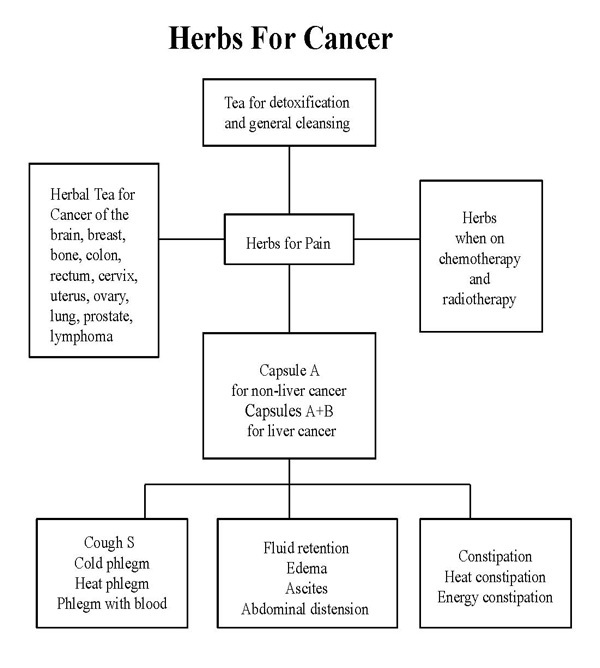 In addition to taking Capsule A or Capsule A, Capsule C, Capsule D, Capsule E and Capsule B for liver cases, and deTOX, C-Tea and LL Tea, we have formulated various teas for specific cancers. Leukemia 1, 2, 3 & 4 Teas for leukemia. Oral 1 and Oral 2 Teas for oral cancer. Stomach1 & 2 Teas for stomach cancer. Utero-Ovary 1 & 2 Teas for uterine cancer. Hiccup Cold and Hiccup Heat Teas for those who suffer from unceasing hiccups.